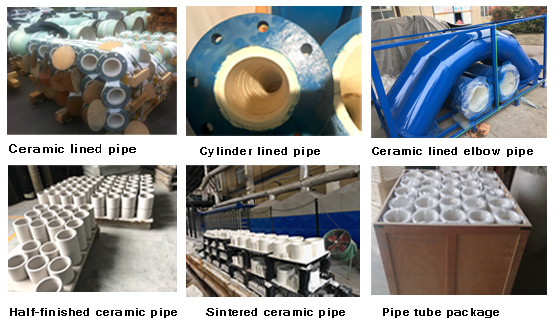 Chemshun Abrasion resistant ceramic tube lining (also called ceramic tubes or ceramic cylinder rings) mainly include ceramic elbow bend pipe, straight pipe liner, tees, reducer pipes, etc, and pipe liners are used for ceramic lined pipework and fittings of pneumatic conveying and slurry pumping. The conveying medium is featured by high hardness, fast and big flow, alumina ceramic tube liner can effectively reduce the speed of wearing through by continuous impact, abrasion and corrosion to pipe wall when long-term conveying medium. — Low maintenance cost: Super wear-resistance reduce the maintenance frequency and also the maintenance cost. Non-metal area of shangliuyuan, Economic developmentzone, pingxiang city, Jiangxi province, P.R.China.